The Photographic Activity Test (PAT) is a worldwide standard (ISO Standard 14523) for archival quality in photographic enclosures. Developed by IPI ( Image Permanence Institute), this test predicts possible interactions between photographic images and the enclosures in which they are stored. The PAT is also used to test the components of enclosures, such as adhesives, inks, paints, labels, and tapes. The test involves incubating materials in temperature- and humidity-controlled chambers to simulate aging and takes from four to six weeks. After incubation and sample evaluation, a final report is provided. It is the subject of International Standards Organization standard 14523:1999 subsection (E) Photography-Processed photographic materials-photographic activity test for enclosure materials. Samples are then incubated for 15 days in a temperature- and humidity-controlled chamber at 70°C, 86% RH. If the detectors that have been incubated with the test enclosures are more faded or much less faded or are more stained than those incubated with the controls, then the enclosure material fails the test. at Rochester Institute of Technology. 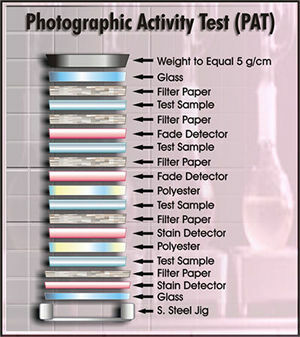 Clear File Archival Pages PAT Test Results. Independent laboratory tests prove that Clear File archival storage pages provide safe, long-term protection for negatives, transparencies and prints. Clear File uses a specially formulated polyethylene and polypropylene so that their products provide maximum long term protection for delicate photographic emulsions. Clear File's museum quality, archival pages are acid free (pH Neutral) and contain none of the platicizers, catalysts or solvents found in PVC.